Today we look at teacher pay. How do we compensate and reward teachers at UCF? Large employers in the private sector jobs (and even most federal and state government jobs) are ‘graded’. This means that jobs are grouped together for pay purposes according to the level of skills required, and the level of responsibility that goes with a job. Jobs that require higher level skills and more responsibility will have a higher ‘pay grade’ than those that require fewer skills or have a narrower scope. And jobs with a higher pay grade offer higher compensation. Within each salary grade, there is a pay range. And the salary grade minimums and maximums are set for each grade based on local labor markets. For example, Grade 3 jobs in Wilmington DE might pay $50,000 – $75,000, while Grade 4 might pay $65,000 – $85,000. Within the same pay grade, some employees will be paid near the top of the range: those with sustained higher performance , unique skills, or greater and more-relevant job experience. And finally, there is an annual bonus target for all employees. For employees in the same pay grade, managers will direct more bonus dollars to those who performed better and contributed more during the year. Most private sector employers approach compensation in a similar way. Even federal government and state government jobs are graded and classified, and pay bonuses. While this system is not perfect, it pays each position what the market requires (and nothing more), and it motivates employees to perform both short-term and long-term, by differentiating total compensation according to performance. At UCF, teacher pay is captured in a contract, and that contract is the result of a collective bargaining process between the District and the PSEA. The pay system we have, called a “step and lane” system, is the preferred pay system of national, state, and local teacher unions. It has historically been difficult for school districts to deviate from the “step and lane” system, and as a result, this pay model is dominant across K-12 public education. The first premise of “step and lane” is that all teaching positions are equivalent, and therefore should be paid the same. In fact, there is one salary scale shared by all teachers. In this system, a gym teacher is the same as a physics teacher; a special education teacher is the same as an English teacher; a high-school AP calculus teacher is the same as a kindergarten teacher. Although it is well known that some skill areas are in surplus (Elementary and English teachers) and that some subject areas demand advanced skills (AP Calculus), all roles are paid off a single salary schedule. Effectively, there is one salary grade. Second, performance is not an element of the compensation system. There is no concept of an annual ‘merit increase’ where higher performing teachers get a larger raise than average performers. There are no performance bonuses. How, then, do teachers increase their pay? There are only three ways. The first way to increase pay is to continue teaching. Every year a teacher advances one “step” in the pay system, for a maximum of 16 steps. At UCF, each step in the first 8 years is worth an extra 1-2%, and step increases in years 8-16 are worth 3%-5%. After year 16, base pay tops out on the ‘longevity’ factor. So a teacher who expects to have a 40 year teaching career will “top out” before being half-done with their career. The final way for teachers to earn more is for the entire pay schedule to increase in value. New collective bargaining agreements often (but not always) result in across-the-board increases to the salary schedules. This means that every box in the step/lane grid goes up in value. In UCFSD, schedule increases, when they occur, are usually in the low single digits. So now we understand how ‘step and lane’ pay systems work. In my next post, we will look at how teacher pay changes as individual teachers move through their teaching careers. Teachers can earn more pay by staying in the profession (longevity) and by completing additional graduate education. There are large incentives to pursue graduate coursework. It is worth noting that contract negotiations can result in the deferral of step and lane movements. At UCFSD, step and/or lane ‘freezes’ have been a feature of recent contracts. So even though a teacher may ordinarily be entitled to a step increase each year, the contract may call for a one time, one year pause to pay progression. If this happens in multiple contracts, a teacher will eventually reach the same end point in pay, it may take more years to reach that destination than it would appear from looking at the single salary schedule. As with all elements of collective bargaining, both sides have to agree to any such pauses in pay progression. not sure I see a difference in the pay/lane model that teachers are in and the grade/pay system its compared to…grades 1-12 are the lanes and the steps are movement in the lane. In your model, grade 4 position can earn $65-$85K, basically moving up steps within that lane. what would you base performance on? if you have a class of all AP students and everyone does exceptional, what happens to the teacher that has the remedial courses in the same subject and the students are barely passing? Not everything that happens in the social fields of our society can be transferred to the business practices of our economic system. Good questions! I made the comparison to private sector pay systems because most of our UCFSD residents work outside K12 education and therefore are familiar with that system. And likewise our UCF educators may be less familiar with that system, and may benefit from understanding the differences. I do not think the private sector system is necessarily the right solution for K12 teacher pay, but I do think some features of private sector pay could be helpful. I think that is a hotly debated subject, and in a future post (end of January?) I will try to tackle that issue head on, and I welcome a lively discussion on the topic. I agree that the concept of steps is not too different from the pay progression of private sector employees within a salary grade (SG). 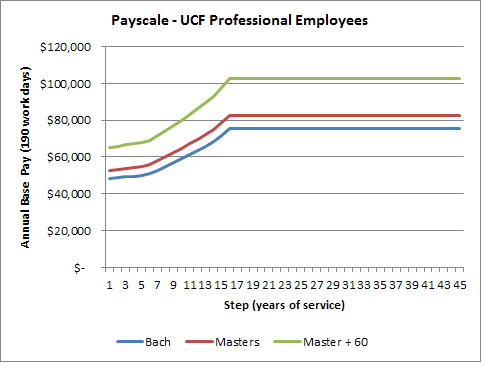 K12 steps are automatic, they stop after 16 years at UCF, and they are not performance based. But conceptually I can see the similarity. The main difference is on the lanes and the SGs. SGs are based on the job requirements, not the characteristics of the person performing the job. An example may help. If I am performing a SG 3 job in Wilmington (such as “junior accountant”) I can do the best job ever, but my compensation will never rise above the maximum for the grade, which is set at $75,000 (based on market conditions). Even if I have a master’s degree or 20 years of experience, the jr. accountant job is only ‘worth’ $75k in the market and therefore to the company. In order to get to SG 4 (and earn up to $85,000) I need to get promoted into a job that requires more skill and/or responsibility (say “senior accountant”). It is a different job. It has a different market value. Even if I am qualified to do the sr. accountant job today, until I get that job and am actually performing it, I will not be in SG4. (This is one reason why private sector employees sometimes switch employers — “I am ready to be promoted, but there is no opportunity here.” On he other hand, if I do not want more responsibility, I can remain as a junior accountant, but my compensation will not change since I am still performing the SG3 job. In step/lane, the lane progression happens not because of an increase in responsibility (teaching more students, or teaching more difficult-to-teach students) but because I have improved my credentials. If that improvement in credentials makes me a better teacher (which I think is the theory) then one could make the case that lane movement is similar to a SG movement in the private sector — in both cases the employee is doing more. But the research does not seem to support the theory that more credentials result in higher student achievement (see my post of Jan 5). In my opinion, the biggest difference between K12 pay and private sector pay (and, I might add, also public university pay and other state/government sector pay) is that the step/lane system does not recognize any differences in jobs. To use your example, the educator teaching AP students is “the same” as the educator teaching the remedial students. Which job is harder? Which requires more skill? Which skill set is more scarce in the market? Which teacher is doing a better job, given the differences in the students they have been given to teach? Step/lane does not ask those questions. The SG system does, and tries to differentiate pay based on the answers to those questions (imperfectly, for sure).